Home » Articles » Short term disability approved, but long term disability denied. Short term disability approved, but long term disability denied. One issue I see all too frequently in my practice is the situation where an insurance company approves a short term disability claim for a period of time (perhaps the maximum time frame, usually no more than 180 days) but then turns around and denies the long term disability claim. Most individuals do not understand how the same insurance company, reviewing essentially the same evidence, and using what is frequently the same definition of disability, can make such contradictory findings. After reviewing hundred of disputed disability claims my experience is that most insureds are simply not skeptical enough about how little their disability insurance company wants to pay their claim. Many people naively believe that getting their claim approved is simply a matter of completing the insurance company’s forms, particularly if their doctor says they are unable to work. All too often, the answer as to why a long term disability claim was denied is simple – it is about the money. All too often, the answer as to why a long term disability claim was denied is simple – it is about the money. It is not about justice or what is right, it is not about what you think should happen, it often is not even about what the doctor says. Follow the money. If you take a step back and do the math, you will understand why long term disability claims are denied. The insurance company may be generous and easy to work with during a short term disability claim because it had a finite period of time to pay benefits, usually no more than 180 days – the insurance company can handle that promise and potential liability. However, a long term disability claim is a different ball game financially. Many employer provided policies provide a maximum benefit period to the age of 65. As a result, on the 181st day of disability the insurance company may be staring down the barrel of decades of liability and often hundreds of thousands, if not millions of dollars, if the insured never returns to work. The insurance company, who was easy to work with during the short term claim is now acting different and much more skeptical in dealing with the long term claim. Typically the long term disability claim will be reviewed by the insurance company’s nurses and doctors. These folks tend to discount everything the insured and the insured’s doctors say about the inability to work and, not surprisingly, their allegiance is to who is paying them. Many people do not understand there is typically a set period of time that one has to be disabled before becoming eligible for long term disability benefits, which is always the maximum time frame on the short term disability claim. Another issue often encountered by individuals is their short term disability claim will be approved but then terminated before they have reached the maximum time frame for benefits. Many people do not understand there is typically a set period of time that one has to be disabled before becoming eligible for long term disability benefits, which is always the maximum time frame on the short term disability claim. Thus, if the long term policy requires an insured to be disabled for 180 days, and the insurance company finds the insured was disabled for only 90 days and not 180, guess what – the insurance company will say that the insured is not able to file a long term disability claim due to a failure to meet the “elimination period.” In plain English, this means the insured was not disabled for the entire duration of the short term time frame which is often a prerequisite for filing a long term disability claim. The reason a short term disability claim will be denied before those benefits are exhausted is because it often eliminates the eligibility for long term disability benefits and it makes it easier for the insurer to deny the long term disability claim if they have already terminated the short term disability benefits because they do not have to explain why in the 181st day, they suddenly found the insured “not disabled” when it did find the insured was continuously disabled for the prior 180 days. Many working Canadians are only a lost paycheck or two away from a financial crisis and insurance companies know this. As a result, individuals whose short term disability claims are delayed, denied or terminated simply do not have the financial wherewithal or the emotional strength required to take on their multi-billion dollar insurance company. 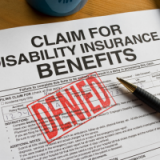 In addition, a complicating factor is that when a short term disability claim is denied, the employer often requires the insured to return to work, or risk losing a job. The insured may suddenly be under pressure from the employer, who may be using the insurance company’s denial of the claim to say that since the insured is “not disabled” she must return to work right away or lose her job. In summary, the best advice I can give is to be aware of the problems related to transitioning from short to long term disability and to call me for a free consultation immediately, if a short or long term disability claim has been denied or terminated.